Expect no fireworks from the best of friends. "Even if admittedly Chelsea’s passing has looked a little pedestrian of late we’re in for ninety minutes of traded blows with both sides uncompromisingly playing on the front foot." Between them Chelsea and Manchester City have won four of the last five Premier Leagues so it follows that when they meet significant truths tend to be revealed. In December 2016 Eden Hazard and co left the Etihad with the points after a complete and brilliant display that frustrated the hosts to such an extent they self-combusted and finished the game with nine men. It was clear to one and all that Antonio Conte's side was very much the real deal and champions elect while Pellegrini's Blues were a fading force. In September of last year City departed Stamford Bridge victorious and the manner of their victory astounded. This was not football as we previously knew it; this was another level and those watching were left in no doubt that not only would they win the title but do so with imperious ease. Perhaps the most pivotal match-up took place in London, April 2017 but it was only so in hindsight. On that evening the visitors were defeated but greatly encouraged after creating the better chances and it was now evident that Pep Guardiola's blueprint was starting to take hold. Since that enthralling clash City have played 61 Premier League games and lost only two of them (to Liverpool and Manchester United). They have scored 174 goals and conceded only 39. They have smashed long-standing records left, right and centre. It makes sense then to not simply anticipate a potential classic this weekend but to look back too, because so often this fixture is more than a game, it's a defining marker for where the power lies at the very top. First though, an example of why the past should also sometimes be taken with a big pinch of salt. In recent times City have dominated the possession stats with 63.7% across the last four meetings. That's quite remarkable given that Chelsea won twice-over but of course these games were half-governed by Conte, the master of the counter. Will we see similar this Saturday? Unquestionably no, not with Sarri-ball in full affect at the Bridge and even if admittedly Chelsea's passing has looked a little pedestrian of late we're in for ninety minutes of traded blows with both sides uncompromisingly playing on the front foot. Last season's Champion's League group stages saw the venerated coaches pit their wits against the other and if this weekend's pairing is anything like the intense six-goal thriller in Naples then our mouths should be salivating right now. Just don't expect the fireworks to extend to the touchline where there's long been a mutual love-in between Maurizio and Pep. 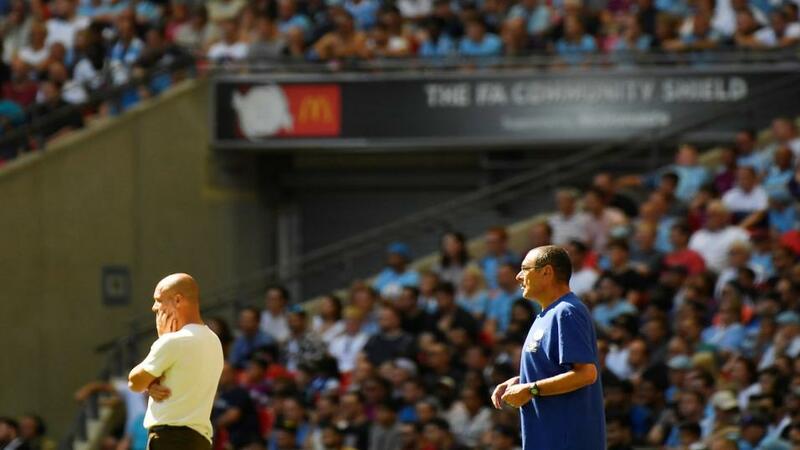 Guardiola has insisted he learns a lot from his counterpart while Sarri recently called the Spaniard a 'genius'. In the summer they dined together, sharing ideas over exquisite food and fancy wine. Which is nice. The expected absence of Sergio Aguero is a huge miss for City even aside from the obvious reasons. His record against Chelsea is impressive with seven scored, equating to a goal every 146 minutes and that doesn't factor in the two he additionally bagged in August's Community Shield. His injury will see Gabriel Jesus leading the line, lacking in confidence and with just a solitary league goal to his name. Chelsea too have problems up front. Morata and Giroud combined have scored exactly half the amount converted by Hazard and Pedro and with the latter having started only seven games that's a serious concern. Or is it? Does it matter where the goals come from so long as a team is prolific and Chelsea and City are certainly that: the Pensioners are the league's third highest scorers while City boast the best goal difference after 15 games since Sunderland in 1892-93. What this does illustrate is how deadly both sides are from wide areas. Hazard has notched 22.5% of his team's tally so far while Sane, Sterling and Mahrez have 21 goals and 21 assists between them; a truly staggering sum. History however contradicts all of the above. This is fixture usually dominated by strikers with half of its 80 goals since 2000 scored by the leading men. Breaking down those goals from the 34 previous encounters this century reveals that only 16 have arrived inside the opening half an hour. This is a peculiar anomaly indeed. Data compiled from thousands of Premier League goals since the competition's inception show that the average scored in 0 - 30 mins of games is 27.2%. Here it's dead-on 20%. If the clubs involved were historically equal in stature that might make some sense but that's not the case here. Prior to their transformative take-over in 2008 City regularly went into the game as underdogs and over a twelve-match period between 2002 and 2008 only managed to find the net once. In fact so superior were Chelsea during this time they spanked City by fives and sixes and yet still so few of these occurred in the opening act. This hints at an idiosyncrasy of the fixture itself and for whatever reason Chelsea and City like to take their sweet time. Another quirk derives from the six occasions in the last 20 meetings one of the sides has conceded first only to ultimately triumph. Typically there is only a 12% chance of this happening once a team goes behind yet here it's bumped up to 30% since September 2008. To put this into further context the North London Derby was recently flagged up in a similar preview as an outlier in this regard because Arsenal and Spurs have managed to turn their fortunes around in 16% of their fixtures. Sixteen per cent is a lot yet Chelsea and City almost double it. Don't be too disheartened if your shade of blue goes one down on Saturday. History has your back. A win or draw for City will see them better their top-flight record of consecutive away matches without defeat but when it comes to their discipline in this fixture warning signs abound. Overall the contest since 2000 has been a perfectly agreeable affair with 121 yellow cards shown to both sides equating to 3.5 per game. In the last 12 games however City have received two-thirds of them. As for reds 10 (7 for City) in 34 is proof that things can get decidedly spicy and it's worth noting that no other official has sent off more players this term than Michael Oliver, the man in charge of a clash that promises the world and might just deliver it.